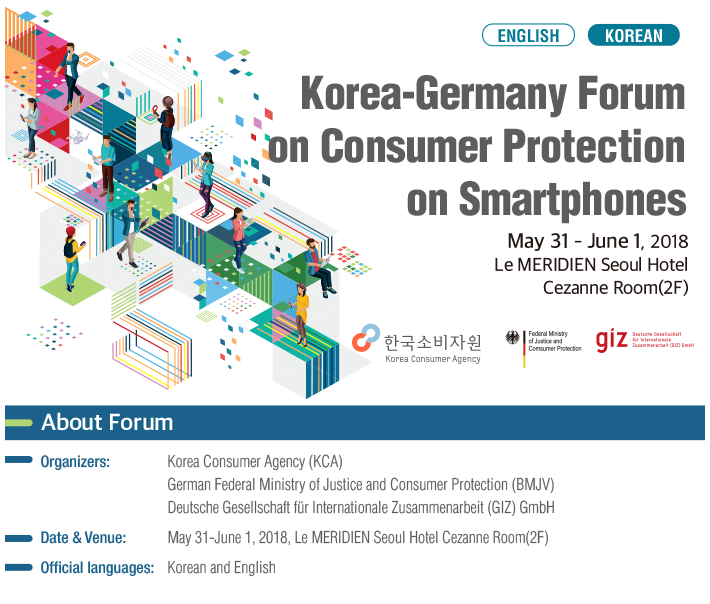 The Korea Consumer Agency(KCA) co-hosted a ‘Korea-Germany Forum on Consumer Protection on Smartphones’ with the German Federal Ministry of Justice and Consumer Protection(BMJV) and the German Federal Enterprise for International Cooperation(GIZ) to discuss ways to secure fairness and strengthen consumer rights and interests in the smartphone era. The two-day Forum was held from May 31(Thu) to June 1(Fri) at Le MERIDIEN Seoul Hotel, and Korean and German government officials in charge of consumer policies, representatives of consumer groups, scholars, ICT experts, etc. attended the Forum. At the Forum, they learned about the current status of laws and regulations and the latest issues in Korea and Germany, and discussed ways to enhance consumer rights and interests. Recently, smartphone-based online service markets have been vitalized as smartphones have become a vital part of our daily lives with the impact of digitalization on society as a whole. Shopping, entertainment, payments, etc. through smartphone apps have already become part of our daily routine, and the smartphone-related markets* are expected to grow further with the development of new technologies including Internet of Things, artificial intelligence(AI), virtual reality, etc. * As of 2017, the domestic wireless Internet industry sales stood at 134,548.5 billion won. The sales have increased by 6.1% on average per annum since 2010, and they are expected to be 163,070 billion won in 2020(the current status of the wireless Internet industry, Ministry of Science and ICT). On the other hand, consumers are faced with a variety of problems such as more sophisticated advertising & fraud, unauthorized disclosure & commercial use of personal information, restrictions on right to choose caused by the provision of inaccurate information, safety & security threats, etc. In this regard, the KCA and the German Federal Ministry of Justice and Consumer Protection shared the view that securing fairness in smartphone-based online markets should be the core of the consumer protection in the digital era, and pushed for the joint forum to review consumer issues emerging in those markets, and find ways to improve them. The Forum began with the welcome remarks by Mr. Jae-Joong, Kim, acting president of the KCA and the keynote speech by Ms. Helga Springeneer, Director-General of the BMJV. In the first session, Prof. Dae-Sik Hong, Director of the ICT Law & Economy Institute at Sogang University and Mr. Johannes Melzer, Scientific Officer of Acatech made presentations about “Securing Fairness in the Smartphone-based Online Service Market” and “The Second Wave of Digitalization”, respectively, followed by the panel discussion among panelists from the Korea Communications Commission, the Voice for Consumers, the Korea Internet Corporations Association, AlgorithmWatch, etc. In the second session, the current status of personal information protection in Korea and the general data protection regulation(GDPR) in Europe were introduced, and ways to secure consumers’ digital sovereignty were discussed. And Korean and German experts from the Korea Internet & Security Agency, the KCA, the Green Consumer Network of Korea, the BMJV, Bitkom, the WZB Berlin Social Science Center, Goethe University, Mobilsucher.de, etc. participated in the session as presenters and discussion panelists. In the last session, a variety of views and perspectives were presented regarding consumer issues in the mobile ecosystem, fair competition environment and ways to protect consumers, and Korean and German presenters and discussion panelists from the Korea Fair Trade Commission, the KCA, the Korea Multi-Channel Network Association(KMCNA), the BMJV, Bitkom, etc. participated in the session. The KCA said that the Forum was greatly meaningful in that Korea and Germany shared the latest consumer issues and formed a consensus on the future direction for consumer protection, and added that it would further strengthen international collaboration to promote consumer rights and interests in the digital economy.